Do you wish it were easier to make fresh home-baked bread everyday? Well, now it is! Martha uses her expertise to adjust the old school techniques of rustic bread baking to work in your kitchen so you can enjoy date flatbreads, fatout bread with seeds and raisin, coconut mandazi, and eggplant flatbread any time in your own home. This coconut mandazi recipe appears in the "Breads" episode of Martha Stewart's Cooking School. Butter a medium bowl; set aside. In a small bowl, combine water and yeast. Let stand until foamy, about 5 minutes. In a bowl, whisk together granulated sugar, salt, and 1/2 cup coconut milk. Add egg yolk to yeast mixture. In the bowl of an electric mixer fitted with the dough hook attachment, combine 2 cups flour, shredded coconut, cardamom, and cinnamon. With the mixer on low, add both yeast and coconut milk mixtures to the flour mixture. Knead dough until soft and pliable but not sticky, about 5 minutes. Transfer to a lightly floured surface, and if dough is sticky, add up to 1/4 cup more flour, as needed. Transfer dough to buttered bowl, cover with plastic, and let stand in a warm place until doubled in bulk, about 2 hours. Lightly flour a rimmed baking sheet. On a lightly floured surface, knead dough once or twice to release any air. Roll dough out to a 9-by-6 inch (23-by-15-centimeter) rectangle, about 1 inch (2 1/2 centimeters) thick. Cut into 24 square pieces. Transfer to floured baking sheet, cover with plastic, and let rise in a warm place until puffed, 45 to 60 minutes. In a medium bowl, whisk to combine remaining 1/3 cup coconut milk and 1 1/4 cups confectioners’ sugar until thoroughly combined and smooth. Add up to 1/4 cup more confectioners’ sugar, 1 tablespoon at a time, until glaze is desired thickness. Set aside. Heat 3 inches (8 centimeters) oil in a medium heavy-bottomed saucepan until a deep-fry thermometer reads 350 degrees (180 degrees C). Working in batches, add about 6 dough squares at a time to pot and fry until golden brown and cooked through, about 1 1/2 minutes per side. With a spider or slotted spoon, transfer cooked squares to a paper towel-lined baking sheet to drain. 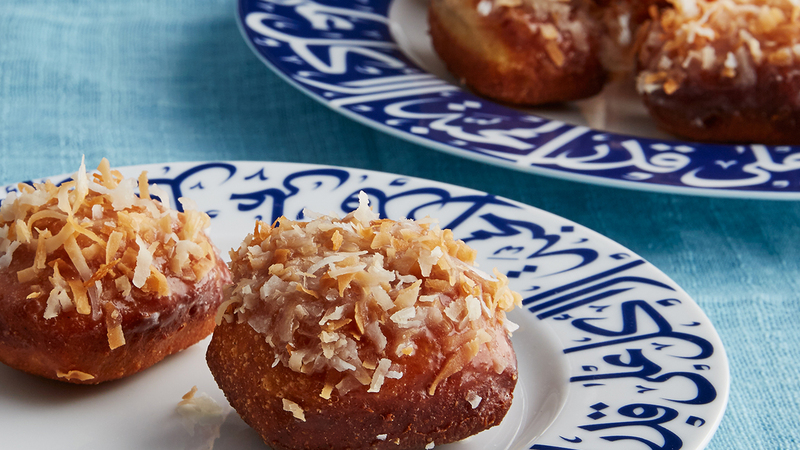 Let cool slightly, then dip one side of each mandazi into glaze to coat and sprinkle with toasted coconut flakes. Repeat process with remaining dough. Best served warm. For more of Martha Stewart’s Cooking School, visit MarthaStewart.com.